ANYONE fleeing Syria because of US airstrikes is not a refugee but a terrorist, the US has confirmed. 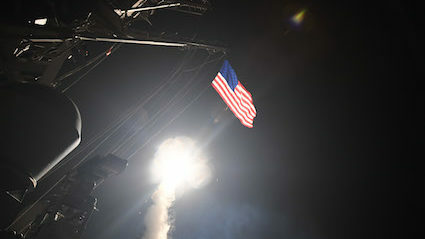 Last night’s missile strikes, and the further strikes expected when Trump wants to feel presidential tomorrow night, are aimed at bad people so only bad people would be afraid of them. Secretary of state Rex Tillerson said: “To flee your home because of evil Assad’s terrible attacks is understandable, though you can’t come here because you might be lying. “But to flee because American-made Tomahawks are streaking through the sky like the rescuing cavalry, precision-targeted on the wicked? Uh-uh. “That’s the US of A you’re running from, and that means you’re a definite terrorist. Very likely ISIS, even if they are shooting at you. 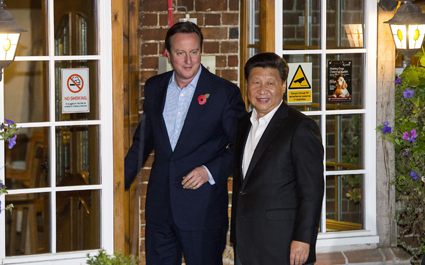 CHINA’S leader has been reflecting on why he must travel so far to meet a moron. Halfway through an exhausting plane journey, Xi Jinping said: “This man is not intelligent. Surely we could have done this on Skype. “It will be interesting to see his house anyway. I imagine it to be vast yet crammed with the most tasteless and vulgar trinkets imaginable, like some huge gilded brothel.